Dunster village in the county of Somerset is one of the prettiest villages in England, sitting on the edge of Exmoor National Park, near the seaside town of Minehead. Many of the buildings are pretty, thatched cottages, with roses growing around the front doors. It was only the first week of May when we were there, so we saw no roses, but the cottages certainly are pretty. 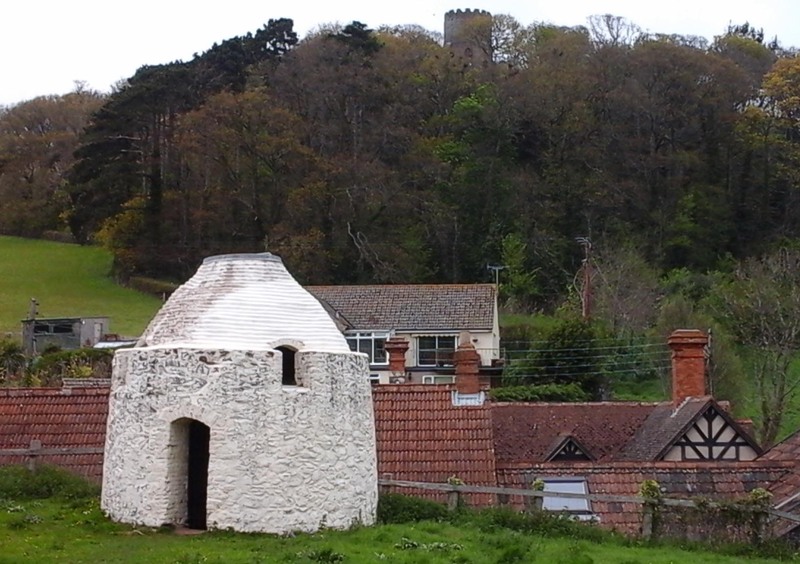 Dunster is also one of the best preserved medieval villages, and has over 200 listed buildings. The origins of the village date back to the Bronze and Iron Age. Approximately 1500 years before Dunster’s castle was built in the 11th century, people lived in the hills above the River Avill, which runs from the Exmoor Hills to the Bristol Channel. There are hints of Roman occupation of the area. It is possible that the old Carhampton road is of Roman origin (or even older) and several Roman coins were found in the 19th century. Aerial photographs of the area around the castle have shown what may be a Roman fort and in 1983 a small hoard of coins was discovered in the ramparts of Bat’s Castle, an Iron Age hillfort near to the village. Saxons invaded the area around AD700 and soon settled on the Dunster site. Although the Domesday Book names the settlement as Torre, it was probably named after a Saxon thegn (thane) named Dunn. After the coming of the Normans in 1066, William de Mohun was granted the land around Dunster by William the Conqueror and in the late 11th century, he built a fortress, which became the administrative centre of his estate. 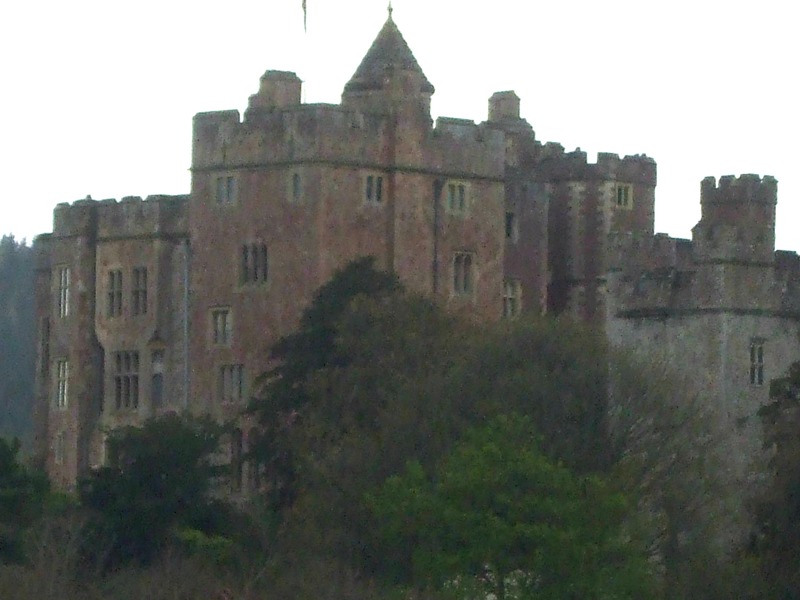 Like so many castles, most of Dunster Castle was destroyed in the Civil War (1642-46). Left behind was a grand Jacobean mansion, which was later transformed into a Victorian country house by the Luttrell family, who have owned the castle since 1376. Back in the 12th century, the village was a thriving port known as Dunster Haven. The sea then retreated, leaving Dunster two miles from the coast. But the medieval wool trade continued to grow, and Dunster made the most of things by becoming the centre of a new weaving industry. By 1222, the village had a market and the first recorded fulling mill was in 1259. By 1840, Dunster had many craftsmen and small businesses, all serving the local community and mostly linked, in one way or another, to the woollen industry. The industry in Dunster survived until the flourishing textile industry in the North of England presented too much competition. 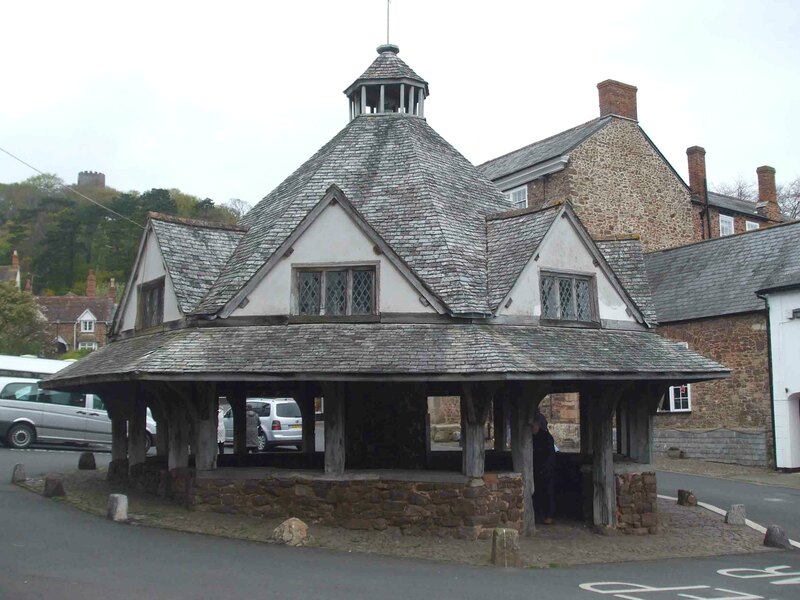 Many of Dunster’s buildings have interesting histories, like the Tithe Barn. A tithe was a tenth part of the agricultural produce or personal income of each family in a village and was collected by the Church. The agricultural tithe was stored in a large barn, called a tithe barn. It is recorded that in 1090, tithes of the Dunster estate, owned by the de Mohuns, were passed to the Benedictine Priory. Today, the Tithe Barn in Dunster, which stands near to the Parish church of St George, has become a Community Centre for the people to meet and hold various events. The Benedictine Priory was destroyed during Henry V111’s Dissolution of the Monasteries (1536-39) but evidence of its former existence can be seen in several names in the village, particularly around the church. The dovecote was once part of the priory’s estate. There was also an old pottery kiln, a survivor of a mid-eighteenth century pottery which produced red earthenwares. Evidence suggests it dates from 1759 and is the earliest pottery kiln to survive almost complete, as well as standing exactly where it was built. On this occasion, we didn’t actually visit the castle. We hadn’t set out to visit Dunster at all, merely venturing there to look for a coffee shop on our way to Minehead. We were totally unprepared for the number of buildings of historical interest. Nor did we know there was a Civil War reenactment on at the castle that day, all well underway by the time we’d had our coffee at the Castle Coffee House (gallery above). So we just walked around with no particular idea of how much there was to see and photographing this and that before having a very nice lunch at the Luttrell Hotel (gallery) and carrying on to Minehead, then Athelney. But we do intend to revisit Dunster at some point in time. We might manage to find the Civil War cannonball hole (that we didn’t know about at the time) that’s somewhere in the rafters of the Yarn Market. Wow, the ceiling of the Yarn Market is awesome! Such an interesting place Millie! They are – and there were lots more that we didn’t get round to seeing. Thanks, Rockhopper. What a charming place to visit! It definitely seems like you could spend a whole day just in that little village, exploring all of the historic buildings! I’m especially drawn to the Yarn Market — what a very fancy building, considering the era (and that it’s not a church). It was a really interesting place, and it definitely needs another visit. But, like many historic places, it gets crowded with tourists. Fortunately, the day we were there, most of them were up at the castle for the reenactment. The Yarn Market was my favourite thing, too. I wish we’d known to look for the cannonball hole, though. Thanks, Joy. Lovely village, so charming. I love historic buildings. It is, and so many old buildings makes it a very interesting village. Hi Milliethom 🙂 It’s so nice to see your comments. I’ve been well. How have you been? Yes, you’re right. I missed a lot of the challenges too. Henceforth, I’m going to make sure I participate in as many as possible. you mentioned a Jacobean mansion…..was this a site that King James of Scotland stayed in or one from his royal court? the buildings are so lovingly maintained and preserved…i would love to visit these places and just feel like i stepped through time. The term ‘ Jacobean’ simply refers to any building from the period 1603 -1625 in English history. James V1 of Scotland became James 1 of England after Elizabeth 1’s (childless) death in 1603. But I have found no reference to James 1 having stayed at Dunster. So the term ‘Jacobean’ refers to the period. i have read about the Jacobean movement in other books and thought it referred to the King alone, thanks for the explanation so i know now that it is descriptive of an era not only the monarch. its a really lovely place and i wish to be able to visit places like these some day. you are so lucky to be so close to such historical sites! The castle seems to be in every photograph 🙂 What a huge part of the villagers life it is, always in sight. Nice to see a bit of Somerset. Some of my eighth generation Aussie family hailed from Somerset environs. Sounds like there is quite a bit of history there. That is disappointing. I wonder why the municipality didn’t capitalize on it, given that The Viking series has sparked so much historic interest.